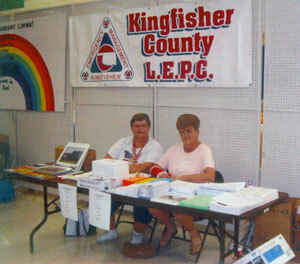 LEPC Booth at the Kingfisher County Fair, August 24, 25 & 26, 2006. A mock disaster exercise was held by the LEPC on Tuesday, March 21, 2006. Approximately 60 persons participated in the exercise. This exercise involved three different locations. These incidents involved explosions, chemical release and terrorist activities. At location 1 a semi tractor exploded next to the Pioneer Telephone Remote Facility located just off of South 13th street and south of Will Rogers. At location 2 a tanker truck drove through the doors of the livestock arena building at the Kingfisher County Fairgrounds. At location 3 a semi tractor and a car collided at the Duke Energy Plant located West of Okarche . Helping with the exercise were the Kingfisher County Emergency Manager, the 63rd CST-WMD Division of the Oklahoma National Guard, Pioneer Telephone, Duke Energy, the Kingfisher High School Drama Department, the American Red Cross, the Kingfisher, Dover and Okarche Fire Departments, the Kingfisher County Health Department, the Kingfisher Police Department and the Kingfisher County Sheriff's Department.